The "U"s of Marathi food are small in number but absolutely delicious nontheless! It stands for ukad or boiled, and that method of preparation (boiling or steaming) is used to make a variety of foods ranging from the very humble, like ukadlelya batatyachi bhaji or boiled potato curry to the very exotic, such as ukadiche modak or rice dough pockets filled with a poppy-coconut mixture and steamed for a special festive occassion. "U" also stands for a favorite Indian breakfast dish: uppit, often called upma in other parts of India, a savory risotto-like preparation of rava (semolina/cream of wheat). Several days of the Marathi calendar are decreed as "fasting days" or upvaas, when one can eat only specific foods; for instance, sabudana (sago), potato and peanuts are OK but garlic, onions, wheat are forbidden. These fasts have an unfortunate tendency to be gender-biased (women fast for the continuing health of their husbands, and even little girls fast so they may get a good husband later in life!) so I don't care for them much. But I will say that after one has eaten all the dozens of delicious and bountiful "fast" dishes, the spirit of pious frugality and deprivation has long vanished into thin air! Other favorite "U"s: uus or sugarcane, a crop that brings prosperity to my region of the country; it is such a treat to gnaw on fresh sugarcane sticks! uusacha ras or sugarcane juice is delicious and refreshing, especially during unhala or summer, which covers 9 months of the year in most of India (the other 3 being monsoon)! But the absolute monarch of "U" Marathi foods is usal, a spicy curry of sprouted beans. It is hard to believe that such a simple and nourishing food can be so delicious and addictive! What's more, usal forms the base for a wonderful dish called misal, a popular snack and street food in India and Maharashtra's contribution to the world of "chaat". 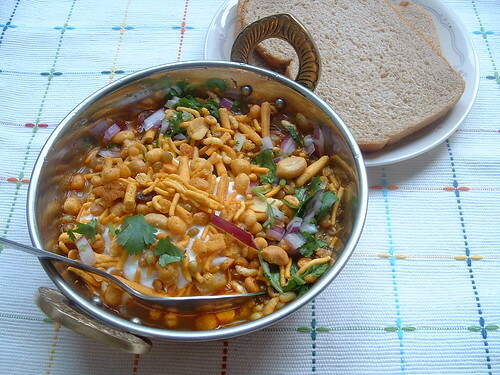 The most popular usal is made with a tiny little bean called matki or "moth", available in Indian stores. Here is a picture of matki, in its dry form, and after being soaked overnight and then sprouted in a damp cloth for a couple of days. 1. A thin soupy extremely spicy curry called "cutt", made with a spice mixture called "kolhapuri chutney"
Lazy as I am, I drastically simplify the whole process. I make the "usal" soupy in the first place by adding kolhapuri masala right into the usal itself (thus eliminating the "cutt"). I also add peanuts and potatoes to the curry itself. Finally I add some jaggery and tamarind into the curry to get the sweet-sour taste in there. I feel like this really cuts down on prep time when you have a misal party. This is a great make-ahead one-pot dish, and a crowd-pleaser at that. We start with the all-important spice mixture, the kolhapuri chutney. I get mine ready-made from Kolhapur (it is made by a women's co-operative food business and is absolutely outstanding). But it is not very hard to make and I give you a recipe below (sent by my mom). 1. Toast all the whole spices on a dry skillet. Set aside. 2. Fry all ingredients (except red chilli powder) together in oil till dry and browned. 3. Grind the fried stuff to a fine powder. 4. Mix with the red chilli powder. 5. Cool and store in an air-tight container in the refrigerator. Note: This spice mixture is made with fresh onions so please take care that they get well-browned and dry, otherwise the chutney will spoil. You might want to cut the recipe down to 1/4 or so, since the quantities given are pretty large. Once the chutney is ready, usal is made in minutes. 1. Heat oil and saute the cumin seeds, mustard seeds, curry leaves and onions. 2. Add the peanuts, sprouts, potato, turmeric, kolhapuri chutney and salt and saute for a couple of minutes. 3. Add 5-6 cups of water (or enough to make a curry of your desired consistency) and bring the curry to a boil. Simmer till the sprouts are tender and the potatoes are cooked. 4. Add the tamarind and jaggery and simmer for a few minutes more. 5. Taste and adjust the seasoning for the balance of salt, sweet and sour flavors. My mother tells me that my method for usal is a lazy, short-cut one. For misal that tastes much better, this is what she does. Instead of just adding the Kolhapuri chutney (in step 2), she makes a masala paste. In a pan, saute 2 chopped onions until browned, then add 1/2 C grated fresh/frozen coconut and 1 T Kolhapuri masala. Stir until toasty and browned. Cool this mixture and grind it to a fine paste. Add this paste instead of merely the spice powder in step 2. 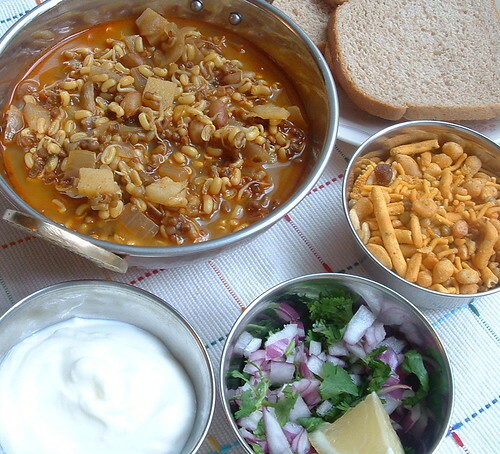 To put together the misal, set out bowlfuls of any or all of the fixings listed above: fresh yogurt, minced onion/cilantro, fresh lemon, "hot mixture" and slices of your favorite bread. Let everyone assembly their own misal to their taste. 1. If you have no time to make the masala, consider simply adding the components to the usal; I think garlic paste, coriander powder, cumin powder, red chilli powder and garam masala might be an acceptable approximation. 2. 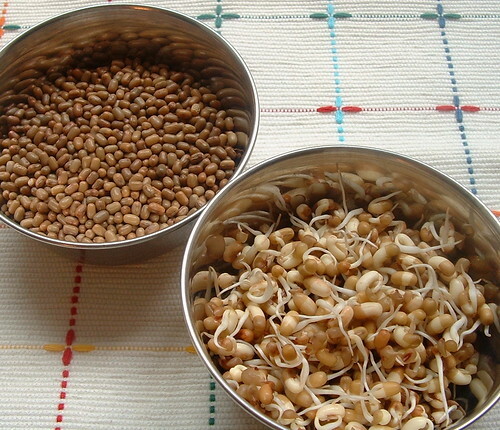 If you cannot find matki beans, try using some other ones like "moong" or even a combination of different beans (all sprouted of course). 3. I have used crushed potato chips as an alternative to the hot mixture and they work quite well to provide that "crunch". 4. You can cut down on the spice as much as you like. A mildly spiced usal combined with dollops of yogurt is an extremely nourishing meal in itself. We meet soon for the "V" of Marathi food; as usual, I love your suggestions and look forward to them. By the way, One Hot Stove celebrates its first birthday this coming weekend, so I hope you will all join me for some cake! Stunning photographs, great display, wonderful presentation! Way to go, Nupur. Thanks, I am definitely going to give your version of misal a try! I usually use Bedekar's Sunday Masala as spice for my version. Looks very tasty. Your small kadai is so cute. Will this also work with moong beans? Am a new reader to your site and absolutely delighted to find it, am surely going to keep reading and referencing it more. My weekday challenge is to make breakfast + lunch in about 45 mins to an hour's time max. I would appreciate if you could add approximate cooking time (duration) in each of the dishes so that folks like me can guesstimate whether that dish is 'do-able' for a quick packed breakfast/lunch. by the way, V could be for ' Vada' (similar to Pakoras)? or how about ' Vangi-bhaath' ? Hi Nupur! This sounds delicious as usual! I still haven't sprouted any beans - and I've been thinking about doing it ever since your sprouted lentil IMBB entry. Time for me to get to it! V for Vada, Varan (too simple, so not really expecting it) or Valachi usal/birde? What a fantastic post, Nupur - and the pix too! I've made usal before, just once... it came out ok but boy, it seemed really complicated to me. Your recipe seems easier, so will try this again. I still have the matki beans left over from my previous attempt, anyway. I do not know much about cooking, but I regularly come to this blog to gawk at the wonderful pics of yummy food you have here. Congrats on the first anniversary. Nupur, misal is a very yummy dish! pictures are very appetising. I have a question after seeing your kolhapuri masala. I want to know the marathi name of a spice. It's called immature capers in English and maratti mokku (meaning marathi bud) in Tamil. It came to Tamilnadu via the Marathas who conquered and settled at Tanjore. It looks like the third picture from the bottom left, on this page. Do you happen to know its marathi name by any chance? Garam Masala, how did you guess??? I totally adore chaat dishes :) could live on them. hence the need to try and make slightly healthier versions of these. Mika, the kadai was a gift from my mom...I love it, although I only use it for serving stuff in and never actually cook in it. Moong dal can definitely be used. The taste will be different and not as authentic but I have no doubt that it will be very yummy. Hi Cathy, its not hard at all. With me, it has become a habit to make sprouts twice a week or so. Bilbo, can't promise you that I will get around to it, so don't kill me :) problem is, I don't much like writing non-food stuff on this blog. Hi Shammi, let me know if it works! Hi BDSN, thanks...hope it works for you! Hi Kay, nope, I don't know the marathi word for that but damn, it looks familiar! I have never actually cooked with these though. "V" is for ... "Vangi", of course. I'm from South India and we have Vangi Bhath. Interestingly we don't call brinjals Vangi but kathrikai (Tamil Nadu) or badneykai (Karnataka). Vangi Bhath was introduced in South India by the Peshwas who briefly held sway over these parts. Happened to stumble across your blogs whilst searching for anything Marathi. Very nice work, I must say. Keep it up. Was looking thru my cupboard today for my usal masala packet; guess i ran out when lo and behold found a packet of Rasoi magic recipe was for assal kolhapuri rassa the packet said assal kolhapuri masala so i tried must say usal came out pretty great. Nupur will have to check and let me know if its the right one. hi nupur, visited your site for the first time...and geez, it's made me sooooo hungry!!! GREAT WORK!by the way, am doing a study on maggi noodles so if you have a combo for it do lemme know ! Do you take the photos of the dishes yourself ? They are awesome. Makes me so hungry !!! And I just cannot stop sending your blog links to my other friends. Great work !! Googled "Misal Pav recipe" and got here. What a fantastic blog you have going. Very informative and great visuals! Am about to make some misal right now and wasnt sure if I was doing it right. Am going to follow your recipe. Hopefully it will turn out perfect! Thanks! but putting this recipe (with extraodinary pictures!) has done wonders and more than encoraged me to take up the pans and confront the kitchen, Kolhapuri style. Looks yummy.I used to go this little place when I was in college in Belgaum to eat Misal,still can taste it!Thanks for bringing back memories. Thanks Nupur for this lovely dish. I made it yesterday by reducing quantities to one-fourth and it was great! Thanks so very much for a recipe written so interestingly. I've been in Mumbai for about five years now, but know very little of Marathi cuisine. Your blog is a mine of information for me and I reckon I'll spend many pleasant hours reading it. Have you tried the Bavdyachi misal anytime when in Kolhapur. Still can taste it!! I just came across your site when looking for Kolhapuri masala. Is Kolhapuri masala also known as Ghati masala? Very nice recipe, I googled for usal pav and got it. Your recipe is in detail. I m going to prepare it now,I m very good cook and I hope this recipe will be very yammy!!! I tried this recipe yesterday and it was AWESOME. The masala was really fragrant and spicy. My boyfriend really loved it too and said that he never thought he could have something like that in the U.S., let alone at home, and that it tasted just like how he remembered. (As I'm not Indian myself, I had never tried it, but I enjoyed it so much that I'm sure it will quickly become one of our favorites). Do you have any other recipes that use the Kolhapuri masala? I still have quite a bit left. I look forward to trying out more of your recipes in the future! Thanks for trying the recipe, and I am so glad you enjoyed it! 1. I often make a mixed vegetable pilaf by sauteeing onion, then adding this masala and chopped mixed veggies and rice, then add water and let everything cook together. 2. Use it in stir-fried vegetables, like a potato-eggplant combination or any such. E-mail me if you would like more suggestions! Sure but do you have the recipe for making mumbai pav? Now if you had that it would mean something. Usal, misal and bhaji recipes are available a dime a dozen. I am impressed seeing the recipe for Misal. I have never made the Kolhapuri masala, yet I reckon it would be fantastic seeing the ingredients. Keep up the great work. Loved your recipies for usal also. Thanks. Wonderful explanations of the Moghul cuisine. I linked to your recipe here! You are so right in saying that Maharashtrian cuisine is largely unknown to non-Maharashtrians. The flavors of Marathi cooking are delectable, and I am sad that they are not represented in any of the "Indian" restaurants outside India, or even outside Maharashtra, for that matter. I came upon your site during a search for a traditional misal-pav recipe. Instead, I have found a wealth of recipes that bring back memories of Mumbai. Great work! Look forward to more. Hi Nupur - I know this post is from a long time ago - but I was wondering if you could answer this Q. I had Usal (unbelievably for the first time), and I wanted to recreate it. I only have green gram dal at home. What is the name of the brown sprouted one? Arundathi, I wonder if you read this post before asking this question. The name of the brown sprouted bean is mentioned several times in the post. It is called "matki" or "moth". I did read the post. Guess I was looking for the English name - sorry to have bothered you. i am so glad that our marathi cuisine is being blogged on so enthusiastically. I too am an obsessed foodie and need to undergo rehab i guess for it! Was just meandering on the net and came across the usal recipe-shamefully never have made usal misal in my life, but now have some fast to make and good to eat menu for sunday tomorrow. baghu kasa hotey!! your update from your mother: do you like this method better? i think the extra step will indeed add to the taste. Have been visiting your blog now for a while, and have mainly been drooling at the pics. Recently came to know that one of hubby's favs is misal. So have soaked and sprouted one cup of the dal, and have sourced the Kolhapuri masala from the local store. Will try it out (hopefully for dinner tonight) and let you know how it turns out. Thanks for all the awesome pics and (esp) Maharashtrian recipes. Hi. Made the misal. It came out quite good. My husband was also quite happy with it. FYI: I followed ur mum's process in step 2. ONe thing is that the quantity generated by sprouting 1 cup (250ml) of the dal was quite a lot. Enough to serve at least 5 adults. So those wanting to try this may want to adjust the proportions according to their requirements. Also, curd should be a definite addition as it really adds to the taste and gravy. Hi Nupur, came across your website by chance and liked what I saw. Well have you tried adding some sabudana khichadi to the misal? It is simply delicious, then you can do away with the bread and eat the hot misal only. Also instead of all this masala, u can also just add 2-3 cloves & peppercorns, small dalchini stick ,2-3 garlic(chopped)for the aroma & flavour and then just add our regular "Goda Masala".add red chilly powder as per liking. I have used pav bhaji masala to make usal which tasted pretty good. I am from northern India and we sprouted moong quite often (by sauteing it for 3-4 minutes in jeera and heeng with just salt, green chillies and cilantro on top). I had never eaten moth dal before eating usal in Mumbai a few years ago. I loved it and have been making it since. One time I did not have moth dal so made usal with moong... it just did not taste the same. Moong dal has a very different taste after it is fully cooked, not as good as moth. So getting moth dal for this recipe is definitely worth it. Nupur thanks for replying back.. Tried it out and it was a success. My hubby loved it.. I tried your mom'version.Please thank her for me..
Hi Nupur, ever since I have left India and want authentic Marathi dishes I am sure to visit your blog, and I always get what I want. This time for instance, I have a Sankrant Haldi-Kunku at my home (in Auckland, New Zealand) this week and I am keen on Missal as a dish, but I want to make the grand style version the kolhapuri way. And you bet, the first thing I thought was to google for it on your blog. Must say the missal looks awesome! This is to let you know how much I appreciate you for keeping the Marathi Spirit alive...Cheers for India, Jai Maharashtra! hi Nupur, I made ur misal today!, it was great, I made the Kolapuri chutney, sprouted the beans Mmm.., thanks to you and mom for the recipe (I did not take the lazy way out, followed ur mom :))), served it with Pulkas and pav buns! ...I was quickly scrolling through when I thought I recognized your karahi, and came back here to check. Damn its weird to realize that I hang out at OHS so much that I recognize your cookware in an unrelated situation! There's a url under 'image credit' but doesn't link to your flickr account or this blog. 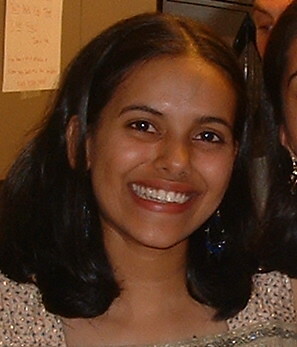 nupur! i made usal yesterday from your recipe and had it with chapatis,its the best tasting easiest thing i made.love! Usal and misal remind me of my college canteen so much and i am glad i could recreate that taste at home. Blog Party: A Retro "Cheesy" Fondue!